SATURDAY-March 9, spend the day with us at The Holland Community Center and create a beautiful bracelet! In this workshop, using a portable Kumihimo loom, you will learn a simple Kumihimo weave called an 8-warp round braid. Lynda will walk you through the basics regarding the loom, Kumihimo cord, loading your beads, the weave sequence, and finishing your bracelet. 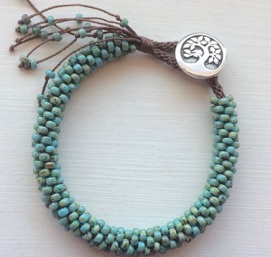 Note: this bracelet is woven one strand and one bead at a time. It is not crocheted. 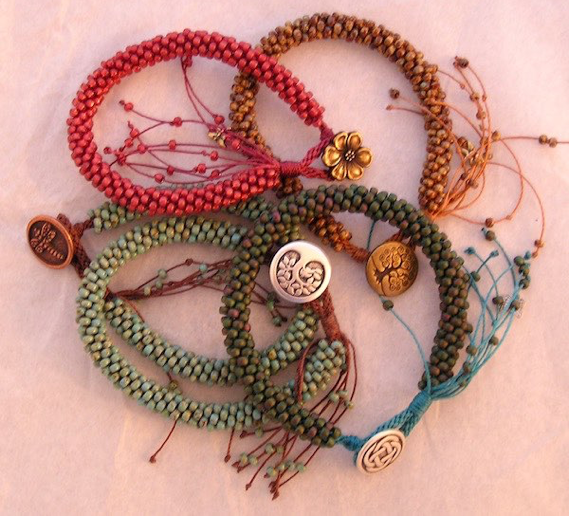 Instructor will provide kumihimo cord, beads, long-shank button (for closure), written instruction, and portable looms. NEW Location: Holland Community Center *It’s a beautiful, relaxing drive! Class size is limited to 10 students and your Pre-Paid Registration is required. You may complete your registration and pay for your class with your Credit Card via the Holland Community Center website. You may also call (480) 488-1090 or drop by the Holland Community Center to register in person. Cllck HERE to register online and for more information about the Holland Community Center.